Hoang Duc Nha was an American-educated Minister of Information for South Vietnamand cousin and Special Adviser to President Thieuuntil 1974. He lived for three years in the United States in the early 1960s before returning to Vietnam at his mothers request in 1965. He describes finding a dramatically changed country, with a changed government and a large American presence. He offers his impressions of different American leaders, including Presidents Johnson and Nixon. He also recounts many stories surrounding the negotiation of the Paris Peace Accord. 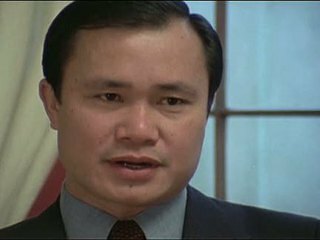 Chicago: “Vietnam: A Television History; Interview with Hoang Duc Nha , 1981,” 12/01/1981, WGBH Media Library & Archives, accessed April 25, 2019, http://openvault.wgbh.org/catalog/V_E23A6B616D0D468EB16D26D5E5F7DE35. MLA: “Vietnam: A Television History; Interview with Hoang Duc Nha , 1981.” 12/01/1981. WGBH Media Library & Archives. Web. April 25, 2019. <http://openvault.wgbh.org/catalog/V_E23A6B616D0D468EB16D26D5E5F7DE35>.